Interfacing RFID Â to 8051 . RFID or Radio Frequency Identification isÂ a method in which electromagnetic waves are used for transmitting data for the purpose of identifying tags attached to objects. An RFID system consists of a transmitter (tag) and a reader.The tag is encrypted with a unique code and the readerÂ scansÂ this code for the identification purpose. The tags are generally of two types: active and passive. Active tags have a battery fitted to it and it transmits the unique code periodically or inÂ the proximity of the reader. Passive tags are powered using the electromagnetic induction from the signal transmitted by the reader. Typical applications of RFID are access control systems, ID cards, human identification, animal identification, payment systems, tagging books, replacing bar codes, tagging merchandise in stores etc . RFID tags are available in different shapes but the most common shape is in the form of a card. The RFID readers are available in the market in the form of a module with all the supporting hardware.Â This article is about interfacing Â RFID to 8051 microcontroller. The images of a typical RFID card and reader are shown below. The RFID card is available in different sizes and shapes and the most commonly used type is shown above. The image of a typical RFID reader module is also shown above. Basically it contains a semiconductor memory for storing the unique ID code, modulating circuit and a coil. The coil acts as the power source by means of electromagnetic induction while in the vicinity of the reader and it also serves as the antenna for propagating the ID code. The modulating circuit modulates the unique code into the transmitted wave. The readerÂ basically contains a coil and an electronic circuit. The coil serves as exciter for the card and also the antenna for receiving the signalÂ propagated by the card. The electronic circuit demodulates this signal and converts it into a form suitable for the next stage (microcontroller). 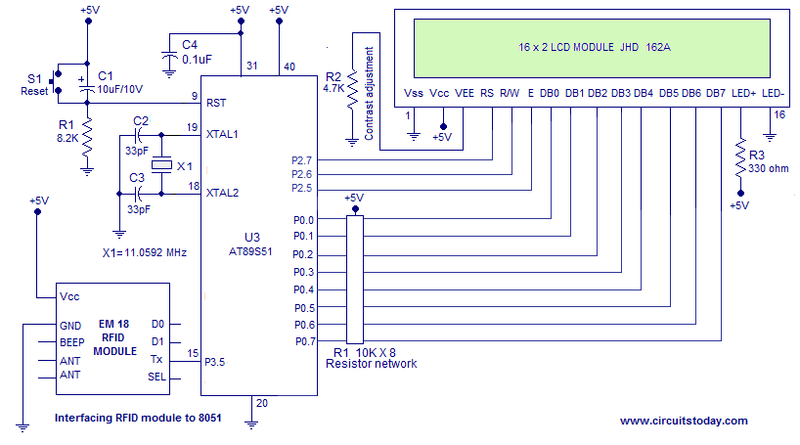 Circuit diagram for interfacing RFID module to 8051 microcontroller is shown below. Interfacing RFID Â to 8051 circuit diagram. TEXT1: MOV A,#52H            //loads A with ascii of "R"
MOV A,#46H               //loads A with ascii of "F"
MOV A,#49H               //loads A with ascii of "I"
MOV A,#44H               //loads A with ascii of "D"
MOV A,#20H               //loads A with ascii of "space"
MOV A,#52H               //loads A with ascii of "R"
MOV A,#45H               //loads A with ascii of "E"
MOV A,#41H               //loads A with ascii of "A"
TEXT2: MOV A,#53H            //loads A with ascii of "S"
MOV A,#77H               //loads A with ascii of "w"
MOV A,#69H               //loads A with ascii of "i"
MOV A,#70H               //loads A with ascii of "p"
MOV A,#65H               //loads A with ascii of "e"
MOV A,#63H               //loads A with ascii of "c"
MOV A,#61H               //loads A with ascii of "a"
MOV A,#72H               //loads A with ascii of "r"
MOV A,#64H               //loads A with ascii of "d"
MOV A,#2EH               //loads A with ascii of "." The program for interfacing RFID to 8051 is shown above and it Â can be simply divided into four parts.Â Configuring Â the serial communication, reading the RFIDÂ card ,fetching it from the memory location and displaying it on the LCD. TH1 = 256 – ((Crystal / 384) / Baud). The crystal used here is 11.052Â MHz and the required baud rate is 9600. Substituting these values in the above equation we get TH1=256 – ( (11.0592MHz / 384 ) /Baud )= 253.Â The SCON register is loaded with 50H for setting serial port mode to Mode1 and enabling the serial receiver. Â All the above saidÂ procedures are the minimum requirement for implementingÂ serial communication in an 8051 microcontroller. The next step is to read the RFID card. The RFID reader is periodically emitting electromagnetic signals. When the RFID card is in the vicinity of the reader, the RFID card will pick up the reader emissions and transmits the Â unique ID code in the form of a modulated radio signal. The reader pics this radio wave,demodulates it, converts it into a microcontroller recognizable forms and outputs it serially on its Tx pin. In simple words the reader emits the unique ID code serially when ever the RFID card is in its proximity. Usually the RFID code consist of 12 characters and the microcontroller has to pick it when ever the reader transmits it. This is done by checking the status of the RI flag in the SCON register. The data transmitted to the microcontroller is receiver by the SBUF register and this process happens automatically. When ever the SBUF receives a complete block of data, RI is made high. So when ever RI goes high, byte inside SBUF is moved into A register and then it is moved into a memory location pointed by register R1. The initial memory location (160D) is pre-loaded into the R1. Then R1 is incremented, RI flag is cleared andÂ the entire step is repeated 12 times for receiving all the 12 characters. Fetching and displaying the unique ID code. The next part is toÂ fetch the individual characters from the memory and display it on the LCD. ForÂ thisÂ address of the memory location of the first character is loaded in into register R1 and then it is moved into acuumulator(A) using the code MOV A,@R1. Then DISPLAY subroutine is called for displaying the current Â character in A on to the LCD display. The entire step is repeated 12 times for fetching and displaying all the 12 characters of the unique RFID code. A simple 5V/1A regulator power supply that can be used for powering this circuit is shown below. This power supply is based 6V transformer, full wave bridge rectifier and a 7805 regulator. The value of crystal X1 is very crucial in this circuit. Its value must be precisely 11.0952 or its integer multiples. Any values other than this will give erroneous results.